I created these alcohol ink panels months ago! 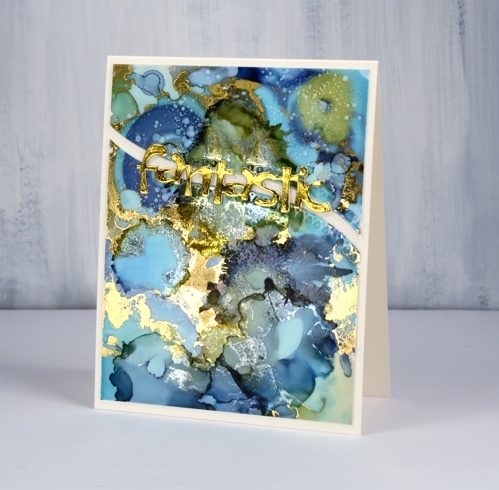 They were the result of a primary colours experiment with pool (blue), raspberry (red) and honeycomb (yellow) alcohol inks and both heavy and light weight yupo paper. I restricted myself to the three colours to see what I could come up with and how they reacted with each other. I was able to get very soft blends by adding rubbing alcohol and tilting the yupo around. This panel was done on light weight yupo which is translucent. When I held it up to the light the colours softened and looked like stained glass. 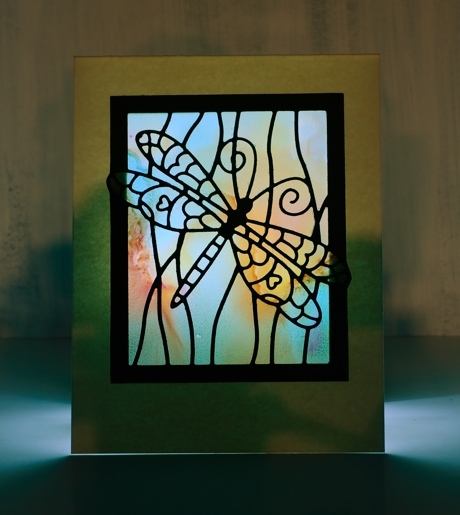 I decided I had to cut the cardstock out behind the dragonfly ‘window’ so a light could be placed under the card to show off its soft blended colour. Not a real tealight mind you, remember this is paper crafting! I took a photo to give you an idea of the pretty stained glass effect you see with a soft light underneath. The same colours appeared but with more lines by working the inks for longer. By that I mean that I kept adding and tilting and blending so there are more secondary and tertiary colours in the mix. When it came to making the panels into cards I decided die cuts over the top was all I wanted to add. 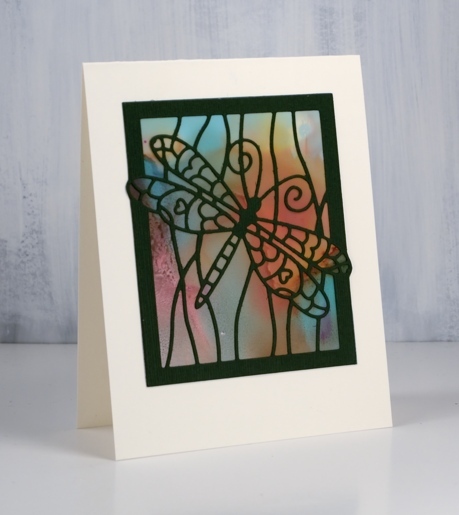 I used three Penny Black dies, dragonfly frame, serenity and heartfelt thanks. For all the cards I put double sided adhesive on the back of the green cardstock before die cutting the images and words. In the final sample I was able to keep some of each ink colour distinct as well as each secondary colour (blue+yellow=green) (yellow+red=orange) (red+blue=purple). There is also a bit of brown which is is a tertiary colour made when a primary and a secondary mix. I created this panel by dropping the inks onto the yupo panel and letting them move and fill the space. When there was a good mix of colour patterning the whole area I switched to placing tiny drops of ink or rubbing alcohol onto the panel to create the bubble patterns. Each tiny drop expanded into a little circle or blob shape. The pattern looked very busy all on its own so I just added a small die cut word. I have done some experimenting with alcohol lift ink in the past month and learnt a few things along the way. There are a couple of variables that can affect the process and results. The main thing I learnt is that it does not hurt to let things dry longer than you think might be necessary. Let me give you some examples. So far I have done all my experimentation on yupo paper with one or two colours of ink and some rubbing alcohol to help move the ink around and create colour variation. 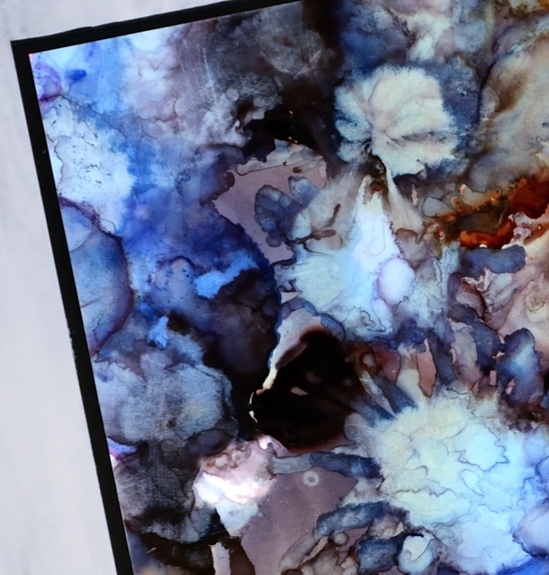 When you create an abstract background on yupo paper let it dry for at least 10 minutes but preferably longer; if it is humid weather it will need to be longer. Sometimes I have so much fun creating pretty background panels with alcohol ink I end up with a lot of ink on the yupo; the process will work best if I give all that ink plenty of time to dry. Once the coloured panel is dry it is time to use the alcohol lift ink. The ink takes out some colour but not all the colour. You can see in the two panels below it went from dark to light. Even with a light panel the lift ink will still remove some colour but the contrast will be less and the effect more subtle. 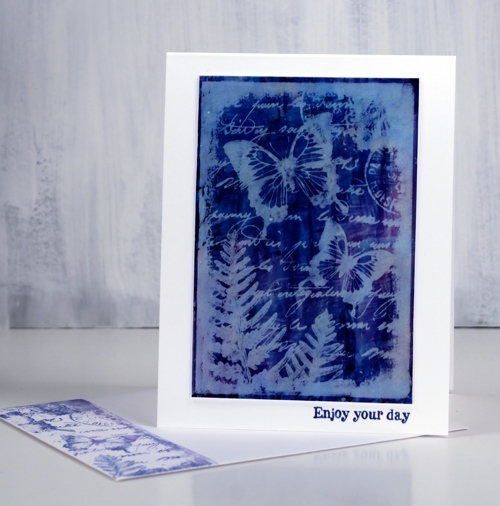 This Darkroom Door collage stamp was perfect for the technique and shows you that solid stamping and fine detail stamping both work with the alcohol lift technique. I positioned the stamp in my stamp positioner, inked it with alcohol lift ink and pressed it down onto the coloured panel. After a few seconds I lifted the stamp, removed the panel and set it aside for more waiting. While I was waiting I pressed an envelope down onto the stamp which was now covered with the ‘lifted ink’. I pressed the edge of the envelope onto one side of the stamp because I did not want the whole stamp image. You could put a piece of cardstock into the stamp positioner and stamp the whole lifted image. After at least ten minutes of drying time I returned to my alcohol ink panel and started dabbing the lift ink off with a paper towel. Each dab picks up some colour so I kept rearranging my paper towel so I would not be dabbing colour back onto my panel. When there was no more evidence of ‘shiny’ lift ink on the panel I gently buffed the panel with a clean area of paper towel. If all the ink is dry at this point the stamped image will get clearer as you polish. 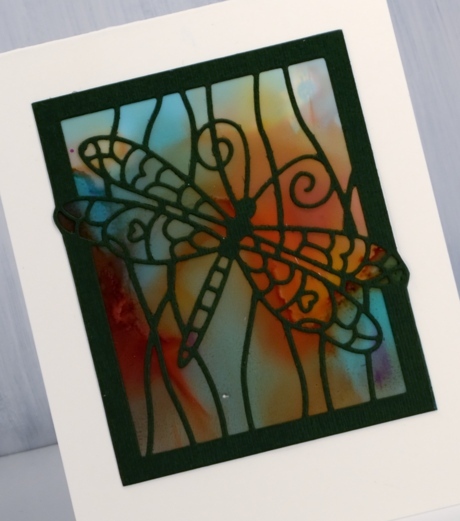 If there is any wet alcohol ink or lift ink the image will blur or spread. This is why it is worth giving the panel plenty of drying time and dabbing time. 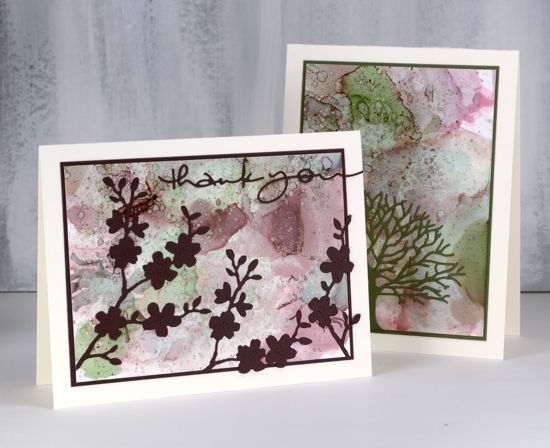 The card on the left was made with just ranger pitch black alcohol ink and rubbing alcohol; I ended up with black, pale blue and burgandy areas on the panel. 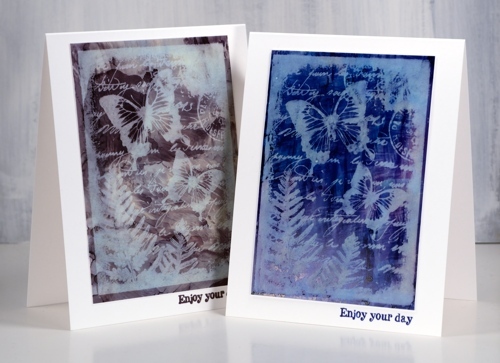 The card on the right was made with ranger indigo alcohol ink and I think some cloudy blue as well but I didn’t write them down so I’m not sure. The stamp has its own frame so I just trimmed my panel close to that and attached it to a white card base. 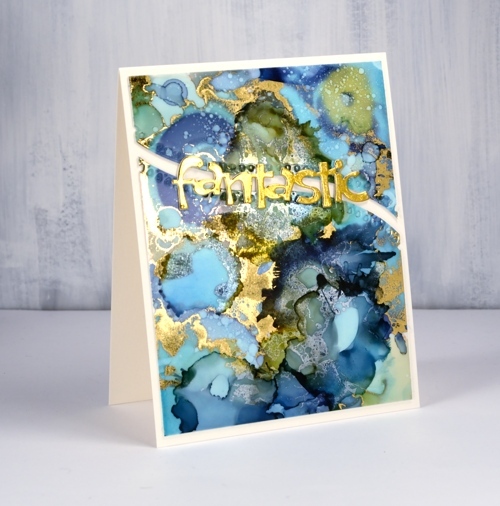 It is worth watching a couple of alcohol lift ink videos before you try the technique. After completing a few panels I found myself wondering which stamps I would try next. I hope you have enjoyed my alcohol ink projects this week. I could have happily continued playing with colour combinations and different techniques but other projects beckoned. Once again I used a colour combination curated by Ranger; this one is called ‘Cottage Path’ and includes slate, currant and meadow. I worked on the heavyweight yupo paper and dropped inks randomly over the panel to begin. Once there was plenty of coverage I used a small cheap paintbrush (plastic bristles) to flick rubbing alcohol as well as the ‘cottage path’ inks over the panel. The result is very fine circles over the top of the larger blobs of colour. 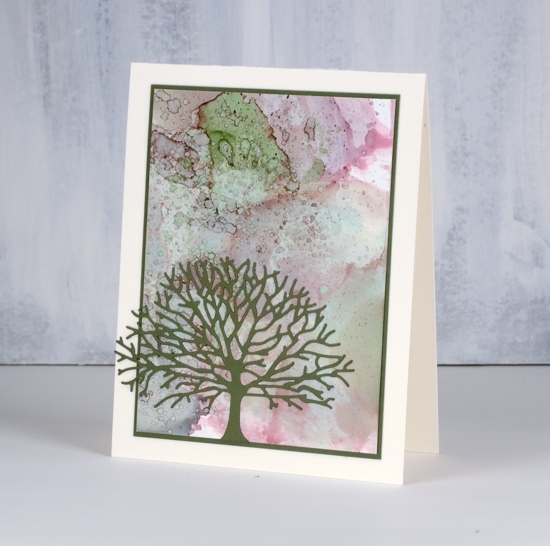 I matched my cardstock to the ink colours and die cut a tree from green using the Penny Black ‘branching out’ die then matted my panel with the same colour. On the other card I cut a couple of ‘cherry blossom’ die cuts plus a sentiment. 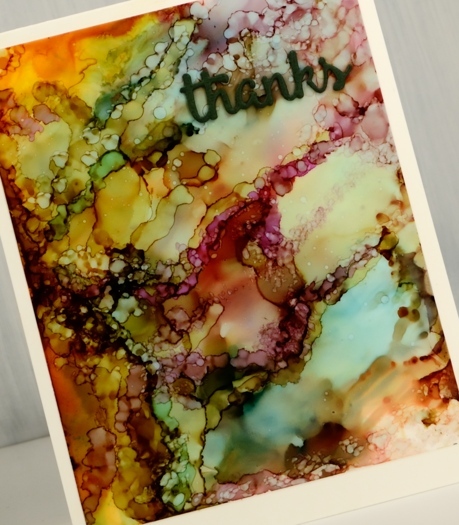 If you have played with alcohol inks you will know it’s hard to stop once you get started. When I was trying out my new heavyweight yupo from the Foiled Fox I decided to experiment with another colour combo packaged by Ranger. 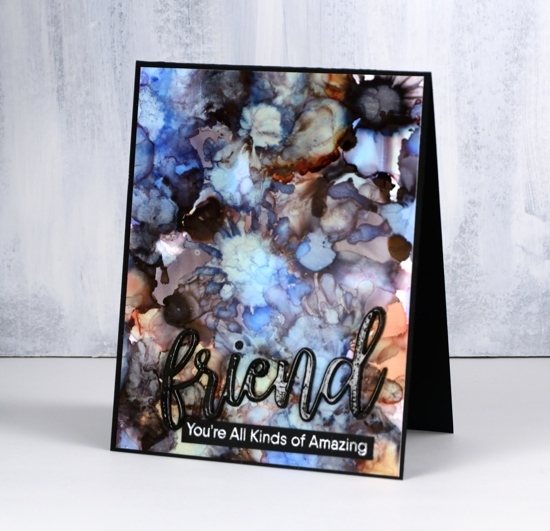 This panel features the three inks from the Miner’s Lantern set, stonewash, rust and pitch black. What I loved about these colours as I started experimenting was the variety of tones and shades I was able to get as the colours mixed. To create the patterns I dropped the colours randomly on the yupo then blew air on the drops with a straw. You can use a can of compressed air or an air brushing tool also. If you blow on the inks when they are still wet they spread into flower shapes and create pale transparent patterns. I used some drops of rubbing alcohol also which dilutes and mixes the inks. When the panel was dry I trimmed it to fit on a black card base and added a die cut sentiment and an embossed sentiment both from My Favorite Things. The word die (from the ‘friend duo’ set) I cut from black foam and black cardstock. Before I attached them to the panel I embossed the black cardstock word in clear powder to give it a shiny surface. I glued the foam down first, then the embossed cardstock ‘friend’ on top. 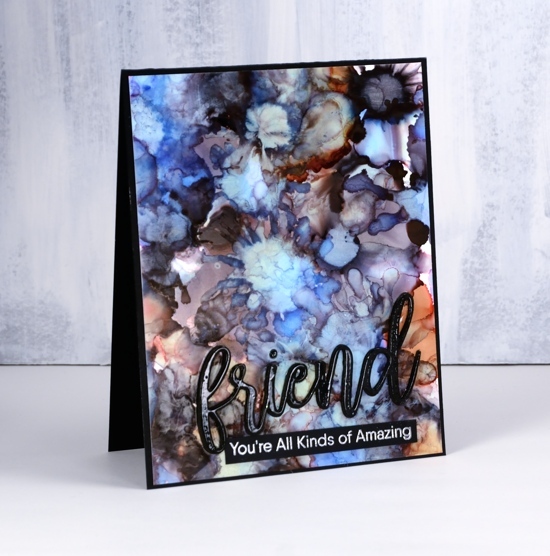 I embossed a phrase from the MFT ‘Anything but basic Friendship’ set in gun metal embossing powder – a new colour from Ranger. My favourite part of the panel is this top left corner with all the blues! 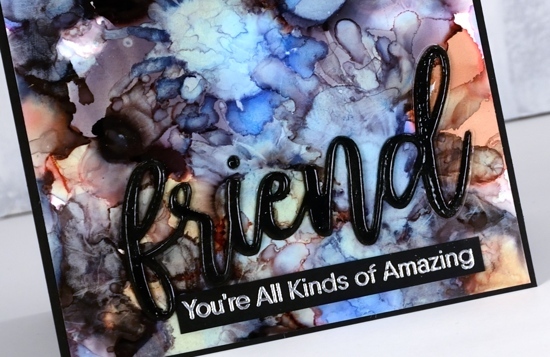 Not long ago I learnt from a couple of friends that foil will stick to some alcohol inks. 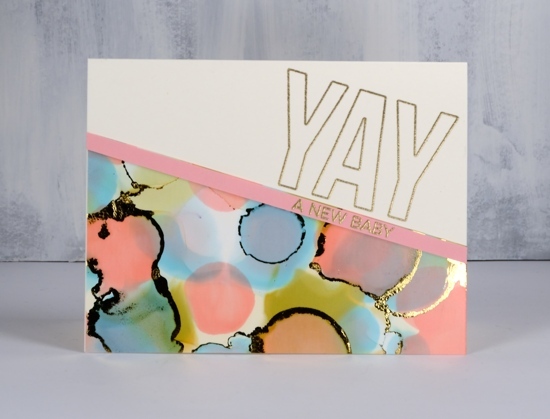 I posted a card at that time and continued to experiment with foil and alcohol ink panels. 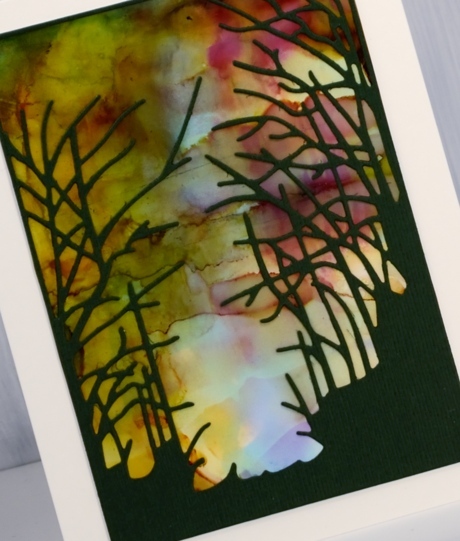 If the alcohol ink sitting on the yupo paper is a little sticky the foil will stick more readily than if the inks are long dried. 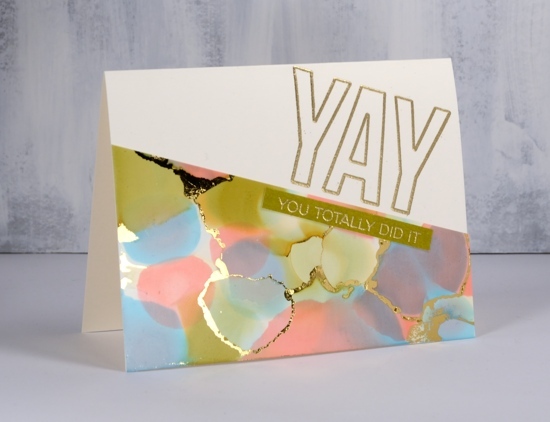 I ran today’s panel through my minc not long after I’d created it and a lot of gold foil stuck. Foil doesn’t stick to all colours of alcohol ink and I’m sorry to say I have not done exhaustive testing to know which ones work. 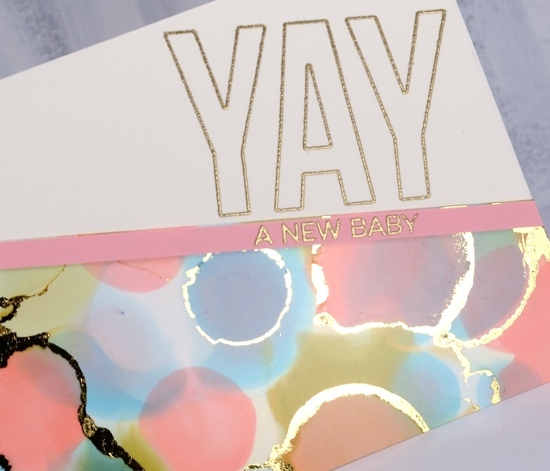 I just layer on some foil, run it through the minc and see what I get! I was pretty happy with what I got this time there were some really pretty gold highlights, but a few more than I wanted. 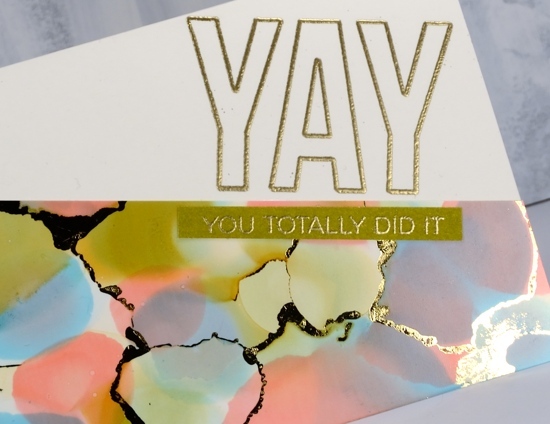 I decided to see whether I could add alcohol ink over the top of the foiling just to tone some of the gold down a little. I was pleasantly surprised to see the gold foil change to a dull silver when it came in contact with the ink. It is definitely hard to photograph the results but my blue and green panel has gold highlights as well as subtler silver patterns. To turn my panel into a card I backed the yupo with white cardstock then cut it in two using the curved stitch die from Penny Black. 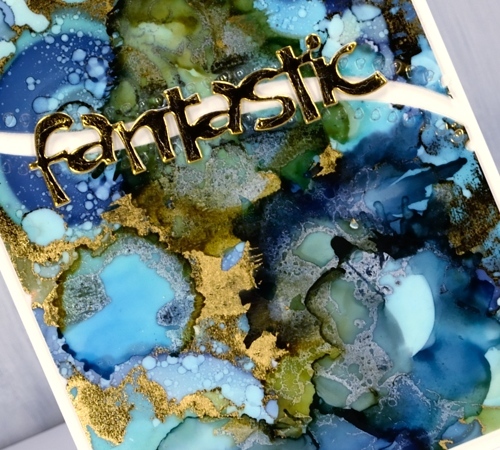 I stacked some gold die-cuts to make the word ‘fantastic’ look a little more fantastic and added it all to a natural card base. I think this one might turn up as a graduation card this June. 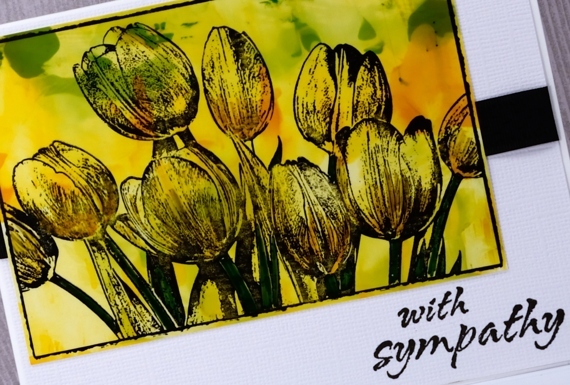 I have used an alcohol ink background to add colour to this tulip card. 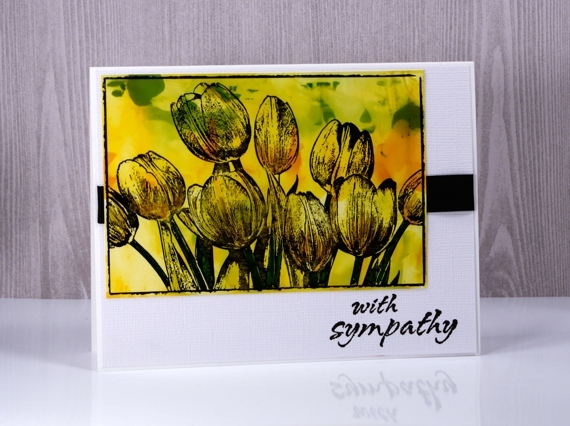 Deciding on a colour scheme and image for a sympathy card can be difficult but flowers are given and appreciated at times of joy as well as sadness. Out of interest I looked up what meaning if any, has been assigned to yellow tulips. Apparently the meaning has changed over time but yellow tulips now stand for hope and cheerful thoughts. 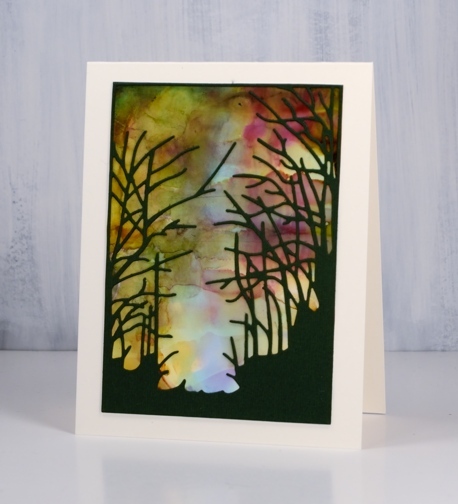 To create the yellow, orange and green panel I dropped alcohol inks on a craft mat then swiped photo paper through the colours. Sometimes it is necessary to swipe several times or add a bit of rubbing alcohol to get coverage over the whole panel. I inked the Darkroom Door tulip stamp with jet black stazon ink then pressed the photo paper panel down onto the stamp. To finish the card I wrapped some black ribbon around a textured white mat and added a sentiment also in black.